Everyone "knows" the Germans had a "final solution" for their so-called "Jewish Problem." But what they may not know is that Adolf Hitler's final solution did not involve homicidal gas chambers, bizarre medical experiments and blazing crematory ovens working night and day to incinerate victims. Instead, Hitler's final solution offered Jewish leaders the island of Madagascar, the relatively untouched, mineral-rich, barely populated, large and secluded island off the coast of east Africa. In a meeting with Vichy French Prime Minister Pierre Laval, Laval agreed to turn the French island of Madagascar into a new Jewish homeland where, ultimately, all of Central Europe's 4,000,000 Jews might be settled. This new Madagascar was to be governed by a joint German-French board with representation granted to any government cooperating. The Nazi World Service—a Jewish group monitoring Germany—asserted that a secret clause of the Franco-German Armistice required that the French government allow Europe's Jews to enter Madagascar. What a paradise Madagascar could have become, but instead Zionists insisted on locating in the Holy Land, where they knew strife and conflict awaited on property they had no legal claim to. 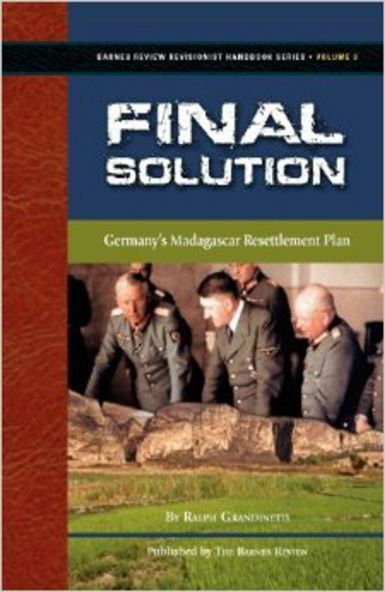 What was the Madagascar Plan and why did it fail? What world leaders supported it—and which did not? Why was the plan eventually abandoned?